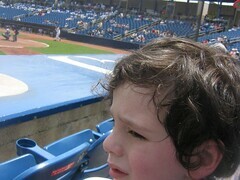 Ryan went to a baseball game and did great! He went with Papa and Dad. We also visited his new school, and went to an outing with Chris’s school mates. And Ryan went to a birthday party, and so did Colleen. I tried to put some of these pictures in sets to make it less confusing and more organized – lots of work to do!! Today was Chris’s last day of school. Unbelievable. He is now a 10th grader! I think. We are so tired — all of us — our oldest has been ill and we are not sure what is wrong. He has autism as I mentioned before and he has been crying most of the time the last week. Drs. don’t know what to do. It’s sad and difficult. We love him so much but don’t know what to do. We are loving on Vanilla Coca Cola (me) and coffee (hubby) and just trying to get through it — it happens like this every few months and then it gets better. In my absence our baby son “RJ” also had ear tubes put in. He had 5 bad ear infections in 5 months. He is doing very well now! Sometime soon I will finish the history I had started before, about meeting my wonderful hubby, etc. !